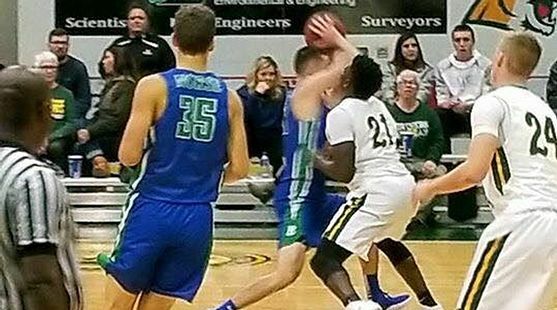 MARQUETTE---It was the first time out for the Bay College Norse men's basketball team on Sunday, and although the game against the Northern Michigan University Wildcats didn't count in the standings, it did give both coaches a chance to see where they're at in their pre-season development. The Norse started strong, trailing just 30-24 midway through the first half, but the Wildcats closed the half on 28-4 run and pulled away for a 107-68 victory in Marquette. Both coaches freely substituted throughout the game, giving NMU Coach Bill Sall a chance to see his younger players. And for Norse Coach Matt Johnson, well, they're all young, all as freshmen on this new college team. Bay was led by Escanaba High School graduate Tyler Willette, with 13 points, and Gladstone graduate Joe Gibbs added 12. Negaunee grad Dre Touminen also scored twelve points. The Norse were good at the free throw line, making 20-of-29 foul shots. NMU, which beat St. Norbert College in another exhibition game on Saturday, was led by Dolapo Olayinka with 21 points, including four slam dunks. Frehman Alec Fruin added 17 points, including five three-point baskets. Northern had 14 of its 15 players score, with the only exception being GLIAC All-Conference selection Naba Echols, who played just sic minutes. The Norse had ten players score, with Menominee graduate Marcus McKenney scoring seven points. Willette led the team in rebounding with six. Now it gets real for the Norse, with the first regular season game this Wednesday. "Meet the Norse Force," to celebrate the first season of Bay College athletic program is scheduled for Wednesday, from 4-6pm. Community youth and adults are encouraged to attend and meet the Norse cross country and basketball athletes and mascot, while enjoying fun and food prior to the evening basketball games. The first Norse women's basketball game, against UW-Marinette, starts at 6 pm in the newly renovated gym on Bay College's campus, followed by the men's basketball game, also against UW-Marinette, at 8 pm. Alumni basketball athletes will be recognized during halftime of the men's game. You can hear both games live on the radio on WMXG-FM (Maverick 106.3) and on-line at www.radioresultsnetwork.com.